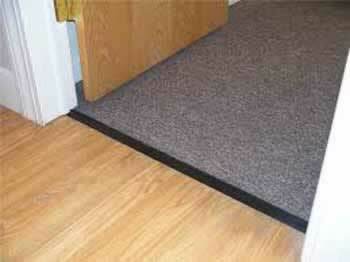 Roppe Rubber Thresholds create a safe and attractive flooring transition. Half Thresholds butts to carpet or ceramic tile and have an installation radius of 9 ft.
Full Thresholds installation radius = 0 ft.
Can I trim to exact size?? How is this product attached to the floor?? I'm thinking the rubber just holds it in place. Am I right? Thanx in advance. Create the perfect finishing touch with these rubber thresholds from Roppe. Available in a variety of colors to meet your design needs. Very happy with this product. It is very sturdy and looks very nice. Much nicer than anything available at the local home improvement stores.